We’ve engineered away most of the natural floodplain that used to exist in the Central Valley, and that’s bad news for juvenile salmon, which once relied on it for habitat. The Knaggs Nigiri Project is attempting to bring some of this back by flooding the fields of rice farmers. The floodplain smorgasbord is open! Wrapping up a successful fifth season, the Knaggs Nigiri Project, partnered with California Trout and the California Department of Water Resources, places fall run juvenile Chinook salmon in inundated rice fields during a six-week period in February and early March, the non-rice-growing season. The project has implications for improving the condition of the fish and the chances of survival by giving them access to floodplain habitat. Historically, large areas of floodplain habitat in the Central Valley were available to salmon during the winter and spring months. Regulation of river flows combined with alteration of river channel geometry by construction of levees and channelization have vastly reduced the amount of floodplain habitat. California’s water infrastructure is designed for flood control and water supply during the dry summer months, but has inadvertently cut off a valuable habitat for rearing juvenile salmon. How do we reconcile these seemingly competing interests? The answer is simple: Use our existing infrastructure, with some minor modifications, to create “surrogate” floodplains in rice fields during the non-growing season. These surrogate floodplains serve as engines of productivity when the water is spread out by increasing the solar influx and driving production of a robust food web. Fish are provided with a rich diet of large zooplankton. At times the water is so full of large zooplankton that the fish appear to be swimming in a “Zoop-Soup.” The fish respond by gaining weight and length at rates that far surpass growth rates of fish confined to the channelized river. Eventually, modification of our existing infrastructure includes plans for an operable structure in Fremont Weir, which will allow salmon and river water access to the productive habitats of the Yolo Bypass even at relatively low flows. Modified operable weirs in the bypass itself will allow water to be impounded, providing floodplain habitat to wild-origin salmon migrating out to the ocean. This impoundment will allow for robust floodplain food webs to establish, giving these fish access to better food resources than in the main river. 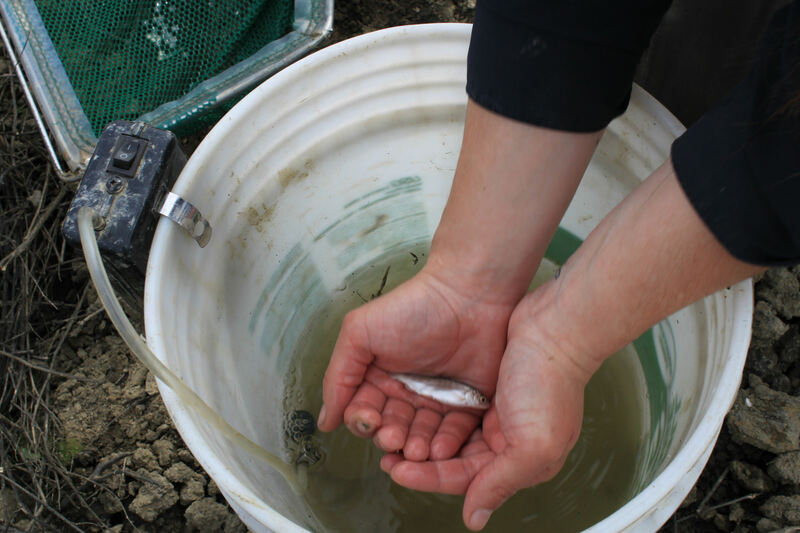 Access to the Yolo Bypass also has the potential to give the juvenile salmon a better migration corridor and a more direct route to the Pacific Ocean. The modified system will be capable of providing floodplain habitat during drought conditions when it can have the most profound impact. Reconciling our needs for water supply, agricultural food production and flood control with the needs of fish and other ecological needs of birds is not impossible. With some creative thinking and engineering modifications to our existing infrastructure we will be able to have a productive system that takes into account floods, farms, feathers and fish! This story first appeared on the California Water Blog, published by U.C. Davis’ Center for Watershed Sciences. Eric Holmes is a researcher at the Center for Watershed Sciences. His work focuses on salmonid restoration and research projects in California’s complex ecosystems.